Initiated by Shriram Bharatiya Kala Kendra the award aspires to augment young talent and for the veterans, creates a benchmark that custodians of Indian cultural forms will value, carrying forward global legacies that have taken birth in India. The prestigious Sumitra Charat Ram Award for Lifetime Achievement was first instituted in 2010 and was presented to Pt. Birju Maharaj, the doyen of kathak Dance on February 21st, 2011. In the subsequent years, the Award has been given to Smt. Kishori Amonkar (Hindustani Vocal Music), Shri Mayadhar Raut (Odissi Dance), Smt. Kumudini Lakhia (Kathak Dance), Pt. Jasraj (Hindustani Vocal Music), Pt. Hariprasad Chaurasia (Hindustani Instrumental Music, Flute). Ustad Amjad Ali Khan Bangash (born 9 October 1945) is an Indian classical sarod player, best known for his clear and fast ekhara taans. 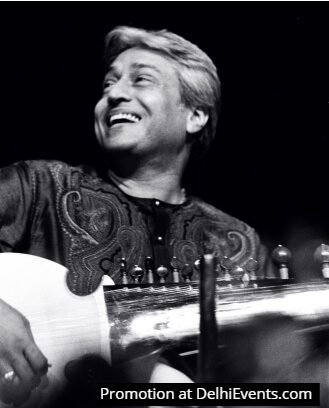 Khan was born into a classical musical family and has performed internationally since the 1960s. He was awarded India's second highest civilian honor Padma Vibhushan in 2001.